#ThemeSongTuesday: WOOP WOOP, It's a Marty Party! - Smark Henry | The voice of Filipino wrestling fans | Philippine Wrestling Revolution, WWE, and more #ThemeSongTuesday: WOOP WOOP, It's a Marty Party! #ThemeSongTuesday: WOOP WOOP, It's a Marty Party! WrestleMania Weekend went by in a flash. Here at Smark Henry, we’re still unpacking the WWE side of things with the ongoing Superstar Shakeup, NXT, and the upcoming Greatest Royal Rumble. Outside of sports entertainment’s biggest company, the Bullet Club Civil War narrative has dominated storylines, criss-crossing over NJPWs Sakura Genesis, and Ring of Honor’s Supercard of Honor over the past few weeks. You probably tuned in to see all of the Cody vs. Kenny Omega matches, but another BC member was doing some equally compelling things. That man is none other than "The Villain" Marty Scurll. His entrances are some of the most theatrical in the industry today, with ring gear designs that scream over-the-top Bond baddie. 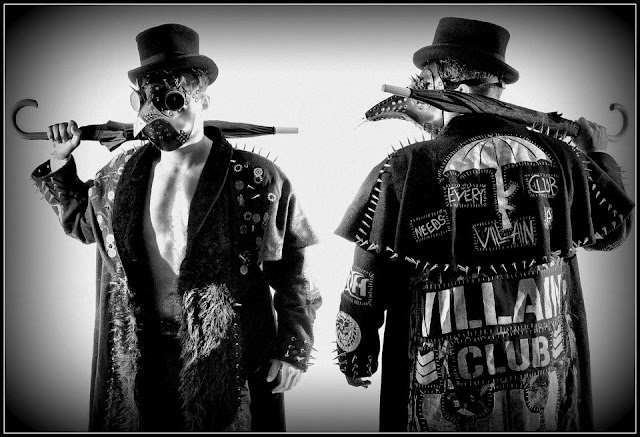 In recent years, he has taken this further from just having fur coats and steampunk shades, to adding an umbrella, a Plague doctor’s mask (yes, that’s what it’s called), and mechanical wings to his entrance attire. He has gone from being one of the top names in contemporary British Wrestling to a bonafide worldwide indie darling over the past few years, a run that includes him capturing the RoH TV Title and the IWGP Junior Heavyweight Title in the process. Throughout his meteoric rise, there is one constant that has followed his success, and it's not just his Bullet Club buddies. It actually has been the eerie theme that ties the character and the wrestling together, the song "One True Villain" as composed by the English outfit Hot Tag Media Works. Here’s Marty’s epic entrance from Ring of Honor's Final Battle last year for a look at how elaborate his entrances have gotten. And if you just want the audio, here's a Spotify link to the theme of the One True Villain for your listening pleasure. Compared to the many, many individual theme songs of Bullet Club members, Marty’s stands out by being the most uncomplicated of them all. It begins with these innocently played high notes on a piano, followed by a violin to add another layer to it. Seemingly out of nowhere, a villainous, almost cliché bad guy cackle breaks the calm. The next thing you hear is Marty’s signature chant, the bird-like WOOP WOOP, and the introduction of metal drums hit over processed bass waves—all of them hitting your ears in an alternating fashion. In terms of wrestling themes, "One True Villain" doesn’t have the bells and whistles you would expect from a CFO$ production. It doesn’t even have any real lyrics to it, with this bordering minimalist with the number of rest notes in it. You just have those moments where the last note echoes for a good half second before you get more heavy-handed cymbals blasting—or what is probably Marty laughing in the background. The main reason that I felt this theme was necessary to put on #TST wasn’t because of the newness to it. Marty has been using this theme consistently since late 2016 wherever he has gone, from the UK, to America, and most of all, Japan. As he’s evolved as one of the emerging stars from this incarnation of the Bullet Club, he has done so by making this gimmick of The Villain work beyond excellent heel work. Marty’s packaged himself as one of the most compelling, nasty, no-good, “I will poison you in your sleep” kind of bad guys on the planet, and that gimmick includes his theme song. Right off the bat, he sets a tone that is menacingly dark, slightly disturbed, and incredibly forceful all at once. As one of the most interesting men in professional wrestling today, I think it’s high time we give The Villain (and his theme) his due. Did you enjoy the Marty Party, or are you a party pooper who doesn’t enjoy creepy entrance theme music? Let us know in the comments below! Raf Camus (@cavemancamus) is one of the hosts of The Smark Gilas-Pilipinas Podcast, an aspiring wrestler, and all around marketing and production guy. His wrestling viewing habits include WWE, NXT, NJPW, PWG. and taking in the local wrestling scene at large. He is possibly the biggest Sami Zayn fan in the Philippines. He enjoys long walks with his dogs, Star Wars, and keeping the voices in his head busy.